Best #1 (upper left): 1810, from Ackermann’s. 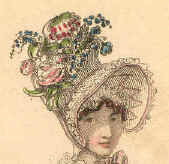 This style was called a “cottage hat”. 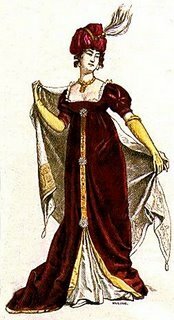 I think it’s nice and simple and just the thing to go with the elegant dresses of the time. It also strikes me as a bit 1920’s ish, but I’m no expert on that. Best #2 (right): 1811, also from Ackermann’s. For me, this is the right way to use flowers. 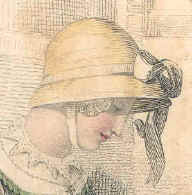 Not too many (even though it does look rather as if she has a bee in her bonnet!) and the asymmetry is cute. Best #3 (left): A gypsy hat, popular for country wear throughout the early 19th century. Nice and casual and, in the days before SPF 45, good protection for that delicate skin. I also saw a portrait of a somewhat older woman wearing one of these, and it looked great on her, too. Best #4 (right): Gilmore’s portrait of Sarah Reeve Ladson, 1823. Turbans often look ridiculous to me, but this one struck me as kinda cool, exotic, maybe a bit Byronic. Not everyone could pull this off, but if you have this sort of sultry dark coloring, I think it works. Granted, some of these are caricatures of contemporary styles, but they give us an idea of the results of a trend gone wild! Worst #1: “Lady Godina’s Rout — or — Peeping-Tom spying out Pope-Joan. 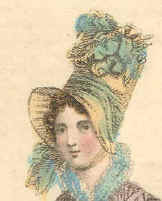 Vide Fashionable Modesty”, a March 12th 1796 caricature by Gillray. OK, this one speaks volumes on its own. But I’ll add that feathers do appear to have their use as a hiding-place. Also, perhaps, to balance out wide hips???? 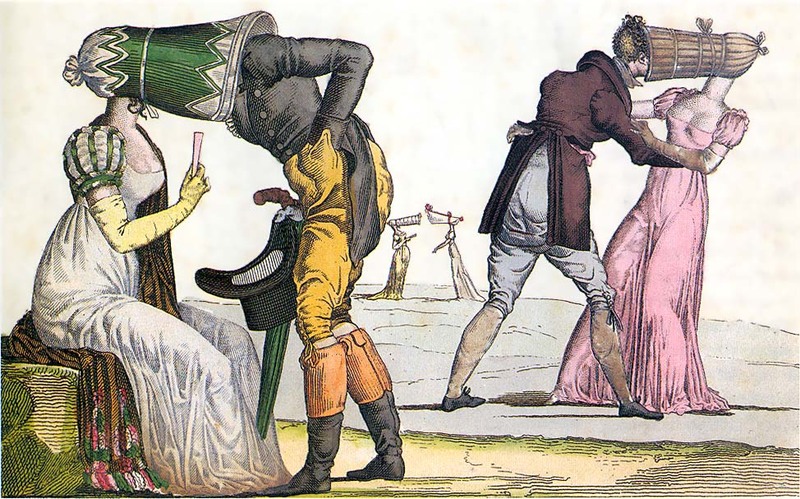 Worst #2 (right): French satire on the poke bonnet (“Invisible”); No. 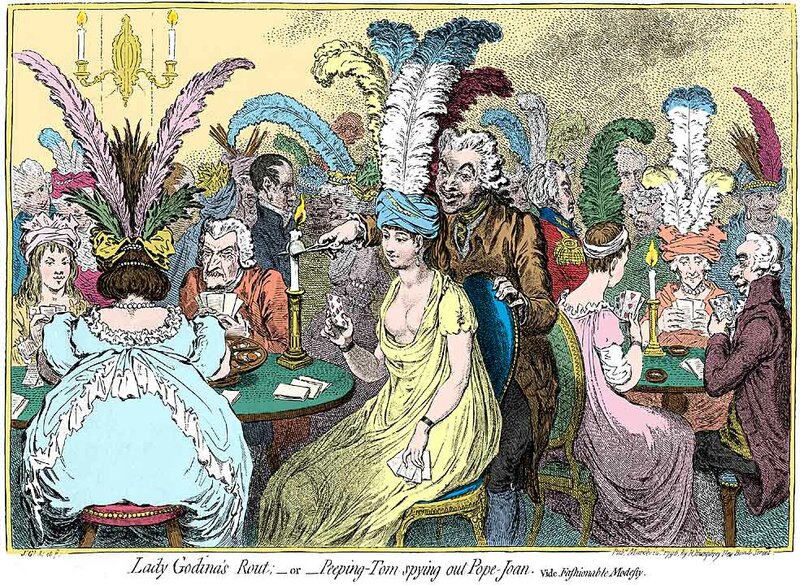 16 in the series of engravings, “Le Suprême Bon Ton” from the second half of the 1810’s. More proof that outrageous millinery has its uses. Any guesses as to what they’re actually doing in there? But of course, these people are French. Need I say more? Worst #3 (left): 1810 turban. I’m rather surprised she can stand upright under that thing. Looks like she’s wearing a miniature beanbag chair on her head, and the feathers look like they came from an anemic rooster. If you’re going to wear dead bird feathers on your head, at least invest in some good peacock or pheasant! Worst #4: 1817, The Lady’s Magazine. Everything I’ve heard about carriages of the time indicates they were rather small. Did the lady wearing this have to crawl in on hands and knees? Just think about what she might have exposed in doing so! OTOH maybe this is a style adopted by petite women in a vain attempt to look taller. You’re not fooling anyone, dears, just embrace who you really are! 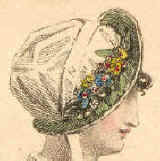 Worst #5: 1818, from La Belle Assemblée. These bonnets trimmed with a profusion of flowers and/or fruit make me wonder. Imagine you’re wearing the latter out for a drive with a rakish gentleman, and then unexpected weather drives you to seek shelter in some secluded cottage or barn (of course that never happens in novels!). Perhaps you could disassemble and eat it. Actually, I have to admit this last one is kinda fun, the sort of thing that would be a blast to wear to a costume party, for laughs. I think it would be fun to wear a turban sometime, too, though most of them seem a bit . . . dowagerish. For now, I’d rather see myself as a stylish matron. So, Riskies and dear guests, which hats do you like, or think you would most enjoy wearing? 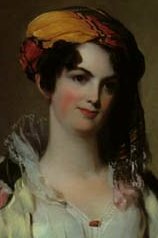 This entry was posted in Regency, Research and tagged accessories, bonnets, Hats, regency bonnets, Regency clothing. Bookmark the permalink. What does it say about me that I like some of the awful ones? I really liked the Worst #5. I like the Best turban, though, too. 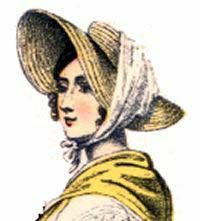 I know I’ve said this before, but I really can’t stand some of the Regency hairstyles, so I think some of these hats–even the awful ones–are an improvement. I would go with best#3 followed by best#1…. I like Best #3 and #4 (though I probably couldn’t pull it off!). I actually kind of like the really tall bonnets that are in “worst”–maybe because I think they would make me taller??? Yes, Elena, I agree that Best #1 does look sort of 1920’s! Charming. Best #3 is delightful — probably my favorite. Strangely, I wear a hat just like Worst #3 all the time! Should I be worried about my fashion sense? So Todd, what do your students think of your headgear???? 1) Is this going to be on the exam? 2) Could you repeat the question? 3) You took off a half point here, and I don’t think you should have. 4) I know your section is supposed to be full, but could I join it anyway? 5) I know your section is way overfull, but could I PLEASE join it anyway? I promise not to complain that you deducted half a point when you shouldn’t have. 6) You deducted half a point here. I need that point! 7) I know that this information is printed on the syllabus, has been announced several times in class and is available on the web, but could you tell me when the final exam is anyway? On the other hand, the one benefit of academia is that you can dress as bizarrely as you like and no one would dream of taking notice. Unless, of course, they thought it was going to be on the exam. Oh, I hope those never come back in style. haha! I don’t really like any of them. Elena–I always got such a kick out of the bonnet styles! Thanks for the chuckle. I just love the French satire of the Poke Bonnets. Men–and women too, I’m sure–have long suffered with fashion…men complained of having no room in a ballroom full of hoop skirts…or bustles…the name of the 18th century style where the frame went East-West escapes me…and then, women had to sit down in them! That was an art in itself. I like hats, but I am fussy about them, just as I am with glasses frames. I have one of those strong faces, and the wrong one makes me look like a bulldog. It gets worse as you get older…No, no poke bonnet for me! Hello, just dropped in to checkout your blog and also introduce our Grand Opening for **www.HandbagExpress.com**. We offer the ultimate superb selection of handbags, purses, wallet, backpacks, with the highest quality and the absolute lowest prices and that’s a promise. We extend our invitation for you to stop on by and check our website out at : **www.HandbagExpress.Com** Thank you and have a great day!